I think bel canto has proven compatible with two of Gelb’s artistic priorities: star casting and slick but literal-minded storytelling (the latter often in the guise of “accessibility”). Most of these productions have been sold on the fame of their casts. Many of the operas themselves have colorful settings and no obvious complicating social or metaphysical angles (Mary Zimmerman’s high-concept Sonnambula was an exception in this regard). They are primarily showpieces. But for this rep to be anything more than routine and mundane you need real star quality singing and charisma. Unfortunately only a few of these productions have found the people capable of that. 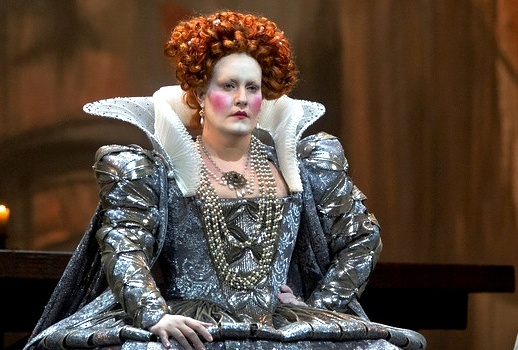 Maria Stuarda is OK, but there’s still a certain fire missing. Donizetti, Maria Stuarda. Metropolitan Opera, 12/31/2012. New production premiere directed by David McVicar with sets and costumes by John Macfarlane, lights by Jennifer Tipton, and choreography by Leah Hausman, conducted by Maurizio Benini with Joyce DiDonato (Maria Stuarda), Elza van den Heever (Elisabetta), Matthew Rose (Talbot), Joshua Hopkins (Cecil), Maria Zifchak (Anna). I guess you have to give David McVicar some credit. Unlike quite a few Met directors, he definitely knows what he is doing and rarely produces the giant “WTF?” moments many other recent stagings have induced. But he hasn’t been very inspired recently, either, and this production is no exception. McVicar’s Maria Stuarda production is more colorful and flashy than last year’s Anna Bolena, but otherwise similar. The costumes are exaggerated period with some tweaks of design and color, the sets minimal and austere. (Both are designed by John Macfarlane.) We open with a big old party, a convenient place for McVicar to stick his compulsory acrobats. But almost everyone is wearing pure white, which cuts down on the bacchanalia factor. McVicar and the cast create a stark contrast between serious, gracious, and feminine Maria and cranky, assertive Elizabeth, the latter adopting a lurching gait and little royal dignity. (I don’t remember the opera’s Schiller source, which I saw in an excellent Donmar Warehouse production a few years ago, as nearly this unsubtle.) Maria is meant to excite the most sympathy, but is shorted on exposition and backstory, and in this production rarely appears more than mildly perturbed. Elisabetta is a far more interesting character, and here developed much more vividly. She has a country to run and alliances to make. Who really cares for this plain imprisoned lady who only occasionally works up a decent curse? The production is, as a backdrop, perfectly OK. It would be fine as a frame for brilliant and passionate performances. Unfortunately we didn’t really get those and it remains kind of weak sauce. Both ladies are miscast and neither projected on the grand scale required. This was conceived as a vehicle for Joyce DiDonato. While the role of Maria Stuarda is usually sung by a soprano, some transposition makes it workable for her mezzo. There’s a long history of this kind of transposition, I don’t object (though in the final scene having a true soprano floating above is more effective), but DiDonato just doesn’t seem right even when it has been lowered. While she sings the notes with exemplary musicality, expression, and taste, her sound is more thin than plush, which in this kind of thing is a problem. Under pressure her tone acquires a pronounced bleaty vibrato, at soft dynamics the vibrato disappears entirely. And her intonation is (or was in this performance, at least) highly problematic, tending flat towards the ends of phrases and in cadenzas wavering all over the place. Sometimes she caught it and corrected but I found it a constant distraction preventing me from ever becoming immersed in her performance. I wasn’t terribly convinced by her acting, either, which seemed too mild to play up to me in the Family Circle. A few big moments–that curse–were staged as Dramatic Actions, but then her voice didn’t really back her up. Maybe it was more convincing closer up, but she never convinced me of her star-ness. I’m sorry to pile on but these are pretty serious issues for a major singer in a new production. Elza van den Heever gives a striking performance as Elisabetta, with a variety of impressive costumes, but her hip-swaying is more Judi Dench as Queen Elizabeth than it is Cate Blanchett as Queen Elizabeth. I did appreciate her spirit, though, and she takes far greater dramatic risks than DiDonato appears to. Her voice lacks the sheer tonal beauty and evenness between registers to be ideal for this repertoire, and has a very prominent vibrato. But it’s certainly an interesting and compelling instrument, very powerful at the top and well-controlled (impressive coloratura for such a large voice), and it will be interesting to see how she develops (possibly in a Wagner-Strauss sort of direction?). Matthew Polenzani is better as Leicester than he was as Nemorino in the fall. He is vocally impeccable, with a far wider tonal palette than either of the ladies, and the voice is just the right size. The older, more established Leicester is a better fit for his personality and age than goofy young Nemorino was. But the role is basically standard tenor posturing, and he never really got a big star moment. The supporting cast was competent but bland, with none sticking very strongly in my memory. The chorus, though, was fabulous, and made the music sound far better than it deserves to (bel canto choruses are, I must admit, a pet peeve of mine–so boring! ), and Maurizio Benini’s conducting seemed perfectly fine to me, certainly better than his work in Elisir. But there’s nothing here that holds a candle to Anna Netrebko in Anna Bolena. I’m sure it will satisfy Joyce DiDonato fans, because there is indeed a lot of Joyce DiDonato, but to me it was rarely more than middling. Since bel canto is not really my preferred variety of opera, my standards for enjoyment may be unduly high, but this one didn’t draw me in. 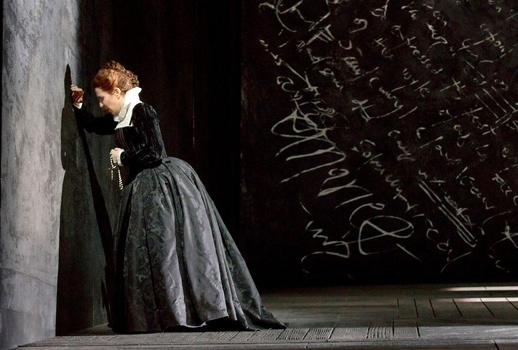 Maria Stuarda runs through January, with the inevitable HD broadcast on January 19. Van der Heever sang a very competent Leonora in Trovatore in Toronto a few months ago. I suspect you are right about where the voice is headed. Were we in the same opera house? I found diDonato's vocal presentation to be spot on throughout, her dramatic presentation varied and appropriate. Perhaps you found her sound thin up there in FS, but in GT it was quite full. It's possible some of that "thinness" comes from working a character built for a soprano, notwithstanding any transpositions, and I'd admit being uncomfortable seeing her sing something last sung by Beverly Sills. But her sound was all there and I didn't find it lacking. diDonato's piano passages were without vibrato for a reason IMHO and for me it worked. I am not a rabid fan of hers but felt she did an amazing job. Ms. van den Heever, on the other hand, while vocally satisfactory, went waddling around the stage with her fist on her hips and leaning in the way she did, looked like Granny Clampett from the Beverly Hillbillies. What was that about?? Kenneth, I noted that I saw this from the Family Circle and also noted it may have been more compelling closer up (in the continuing HD-ification of everything). But I don't think it would have been any more in tune. And our descriptions of van den Heever are pretty similar, I just liked her more than you did. White tone has no place in bel canto IMO. I find DiDonato a compelling stylist in Baroque music (where even intonation works differently) but her voice just doesn't have the range of color for this role. Every high note sounded like she was squeezing it out of a tube. I heard DiDonato sing this role in Houston last spring, and I thought she did a terrific job of it then (intonation, expressiveness, sheer sound, the works). I'm sorry to hear the role doesn't seem to be working out for her at the Met – perhaps an off night? "Elisabetta is a far more interesting character, and here developed much more vividly. She has a country to run and alliances to make." I just returned from one of the dullest evenings I can remember spending in an opera house, and found myself agreeing with your review entirely. Did McVicar even show up to rehearsal? It felt like the work of a college student taking their first directing class, so static and uneventful, the sole focus seeming to be on the blocking — move here — now move here — now move there. Even the productions the Met dredges up from decades ago feel more progressive than McVicar's work in these first two installments of the Tudor trilogy. Totally agree about DiDonato. Her excessive vibrato is ugly and sometimes obscures the pitch, can't understand how she is so successful.